NOTE: We are not yet able to build installers with a Developer ID that is recognized by GateKeeper on macOS Sierra. We apologize for this and will have the problem fixed as soon as possible. Go to the Voices menu at the top of the page and select Downloading. There you will click the link to get your completed voice. Login with your username and password if you are prompted. 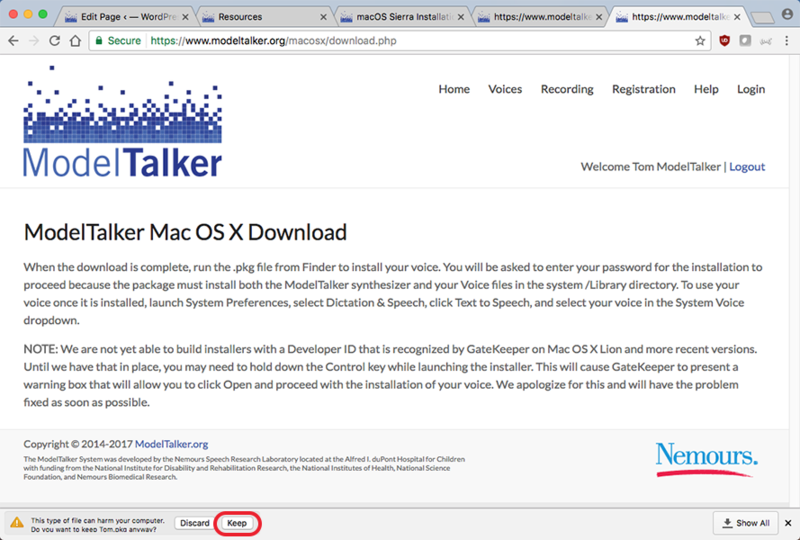 Scroll down to the MacOS section and click download and install the ModelTalker synthesizer package. Read and agree to the End User License Agreement to begin your download. Chrome might give you a warning that this type of file can harm your computer. Click the Keep button to save your voice package (see Figure 1 below). Do not click on the .pkg file at the bottom of the Chrome browser, but instead go to your downloads directory and you will need to hold down the Control key when you click the .pkg file to launch the installer. This will cause GateKeeper to present a warning box that will allow you to click Open and proceed with the installation of your voice (see Figure 2 below). Continue to follow the steps in the installer and enter your Mac password when prompted to install the voice. 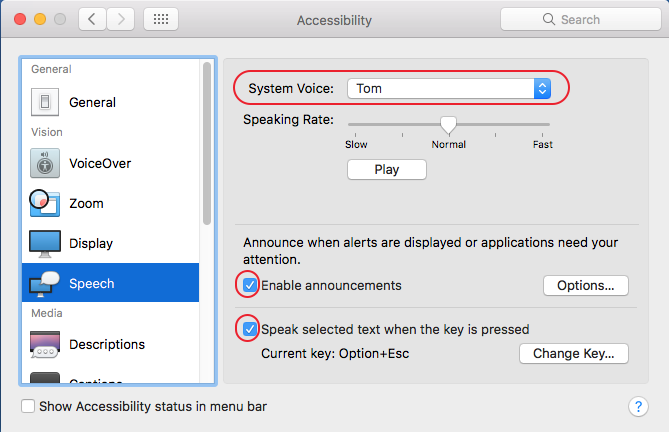 On your Mac, go to System Preferences and choose Accessibility. Select Speech from the menu on the left. Choose your new voice from the System Voice drop down menu and check the boxes to Enable announcements and to Speak selected text when the key is pressed (see Figure 3 below). Your voice is now installed!